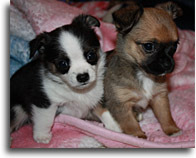 We breed AKC registered Yorkshire Terriers and Chihuahuas. Our Chorkies can be registerd iether with DBR or ACHC. We started breeding Chorkies on request when people came to us wanting to combine the best of both the chihuahua and the yorkshire terrier. We have spent some time refining our breeding making sure we have the best of both lines. Using the Yorkshire Terrier for temperment and coat and the chihuahua for size. We have found that our breeding has consistantly thrown a small well tempered dog. Between 2-5lbs. While we realize that the smallest dogs are the most sought after we will not gaurentee that a dog will mature at 2lbs. This size of dog is not the norm and breeders that claim to be able to consistantly produce a 1-2lb adult are not good breeders. We breed not only for the size of our dogs but health is always priority. If small is what you are after we can advise you during your puppy selection which puppies are most likely to mature on the smaller side. We breed only on request, only when at least 3 puppies have been presold and have 1 litter each year. If you have concerns about Chorkies not being an AKC registerable breed we highly recommend that you read the article The Modern Kennel Conundrum by Jon Mooalem from the New York times as well as doing research on the AKC breeds on your own. The research that we recommend is in how these breeds were established in the first place. You will find that the concept of a "registered pure breed dog" started in its self as a "mutt" in the 1800's. Dogs had long been grouped loosely according to the work they did. But it is not altogether clear what exactly people meant by �breed� before a new class of Victorian dog breeders began shaping the species with unprecedented intensity. At the same time, they were founding legions of new breeds: crossing existing ones and selectively inbreeding only the puppies they liked until the line bred true. Descriptions of what each breed�s ideal specimen would look like were written in �breed standards,� a measure against which dogs could be judged in the show ring. With the advent of dog shows and centralized, recorded pedigrees in the late 1800s, the dog fancy � the culture of competitive show breeders � pushed for strict physical uniformity within breeds and complete segregation between them.¹ The early AKC breeders bred for specific traits that dispite their efforts were not liked by all. It would be wise to remember that while there are many that strictly oppose the crossing of purebred dogs to aquire certain traits. This is in effect how many of the existing purebred dogs that exist today were infact brought into existance in the first place. And just like today when the AKC was establishing its "designer dogs" not all were impressed with the qualities that were sought after. The breeding of AKC registerable dogs is not much different than the breeding of Registerable Designer dogs. Reputable breeders of designer dogs breed for all the same standards of health and confirmation but also breed for additional desirable traits that result from specific types of crosses, whether they are breeding for an apartment sized Mastiff:The Mini Mastiff (French Bulldog and English Mastiff cross) or want a low shedding purse puppy:the Chorkie (Yorkshire Terrier and Chihuahua cross).